This transition freezes the outgoing clip before showing an incoming clip or shows a freeze frame of an incoming clip or freezes the outgoing clip and then shows a freeze frame of an incoming clip. You can also choose to cross dissolve between the clips. The duration of the transition controls which frames are frozen. If you freeze the outgoing clip, the frame at A will be shown until C. If you freeze the incoming clip, the frame at C will be shown from A onwards. If you freeze both, the frame at A will be shown until B, then the frame at C will be shown. You cannot freeze the last frame of an outgoing clip for any duration you want. Final Cut Pro X does not allow transitions to last longer than the frames in a clip. 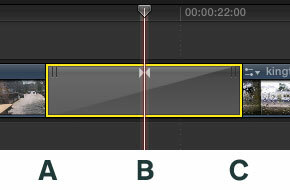 This means that if the outgoing clip’s last frame is at C but has been trimmed so the clip finishes at B in the timeline and a Freeze transition is added so that its duration lasts from A to C, it isn’t possible to freeze any frame in the outgoing clip between A and C. This transition always freezes the frames at the beginning or end of its duration. Transition durations and positions are limited to what Final Cut Pro will allow. 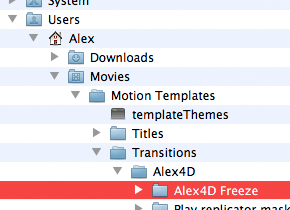 Freeze can be applied to single clips. If you want to momentarily pause a clip but jump forward in the clip afterwards for the duration of your pause, use the blade tool to create an edit in your clip and apply Alex4D Freeze. 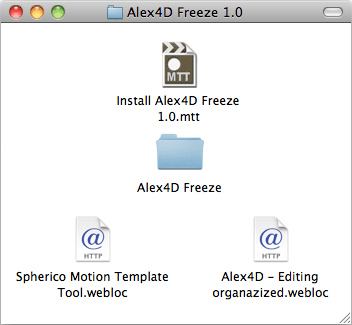 Once you have MTT installed on your computer, double-click the ‘Install Alex4D Freeze 1.0.mtt’ file. What do you see as the advantage with this as opposed to simply using hold frames? I have to admit… I don’t get it. It’s quicker to apply and doesn’t change the length of your project. When applied to a through edit to produce a freeze effect, it isn’t the same as a hold frame. i get blue screen after installing is it due to having an older or newer version of fcpx ? Your version of Final Cut Pro X is too old to use this effect. You need to upgrade to version 10.0.5 at least. Only that it comes up automatically if an update for an app that you *bought* is available. So if someone knows how to turn that (default behavior) OFF, then they know about it, and he obviously knows that there are in fact different versions… but whatever.